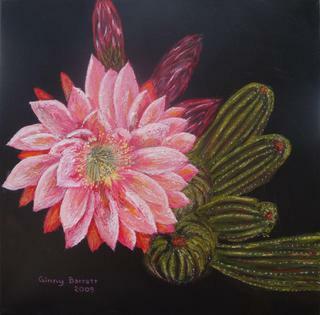 "Pen and Inks To Go"
The Torch Cactus (sometimes called cereus or night blooming cereus) is absolutely amazing. We have one plant in our front yard (with 6-7 "arms"), and it blooms once a year. During that time, each blossom is open for only one day! We watch it very carefully (usually in May or June), and when the buds are about ready to pop open, we pay close attention. One day, we had 9 blossoms, then the next day there were 25 blossoms opened. We were astounded! Ah, the beauty of the Arizona desert.